They are almost twice the size they were last week. And they are so messy. 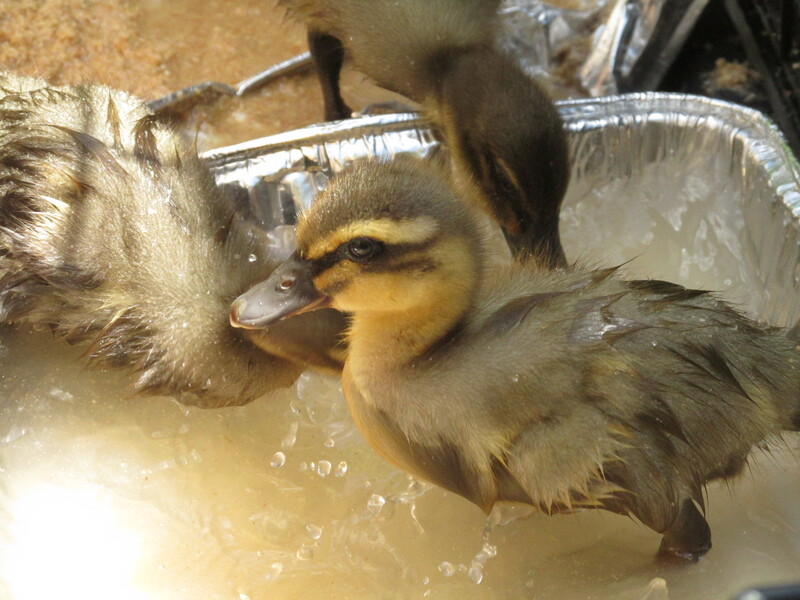 That water is the same color as their starter/grower mash, which they ferry from their food tray to their bathing/drinking pan in their bills and on their down. I admit there are some dogs I’ve just not qualified to own. I’m not going to try an ovtcharka of any sort. That’s just way outside my area of expertise. I don’t think I would be a good fit for a pet coyote either. Now, all of those are based upon what I know and what I know I don’t know. My political views have little to do with it. Now, the dog world is quite political– about the dogs. And those politics are often amusing, and if they were ever to stop, I’d run out of material for this blog in very short time! But I’ve noticed in recent years that the actual human political scene has worked its way into dogs. Many dog breeders are radical libertarians or paleoconservative. Many dog rescuers are vegan leftists. I’m actually neither, though I’d be closer to being called a “leftist” than a libertarian. I left a well-known list on Yahoo! groups because all they did was Tea Party this and Tea Party that and conspiracy theory this and conspiracy theory that. And no one ever talked about dogs. But politics aside, most dog people don’t really care who you voted for. It has come to my attention via a reader in the Blog Readers’ Group today that there is one kennel that is denying placing any puppy or adult dog with Obama voters. This is Oak Hill Catahoulas in Townsend, Georgia. The owner of the kennel is Kyle Duncan. Judging from what it says on the bottom of his website, he’s not a big fan of Obama. And if you voted for him, you aren’t getting a dog from him! If you voted for Obama, or you are a Registered Democrat I will not sell you a dog, You have proven that you can not take care of an animal, there are no food stamps or Obama care for animals!!! Please do not call or Email me, you are a loser!!! Well, I did vote for Obama, even though even though almost no one in my state did, and I’ve been a registered Democrat as soon as I was old enough to register to vote. 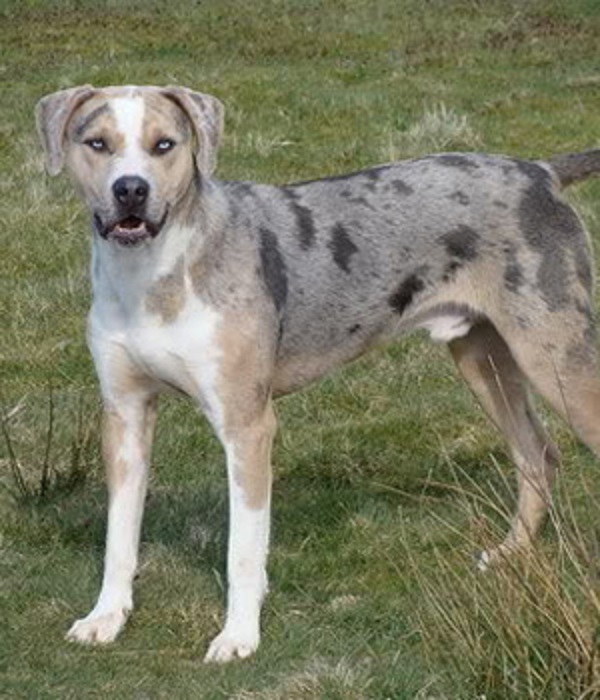 I think this fellow is also operating under the assumption that the only person who would want a Catahoula, which are very good hunting dogs, would be conservative hunter types. But not all American hunters are conservative, just as not all white Southerners are. I can see the idea that you only sell to working homes as a tradition that exists in so many breeds, but why cast the net so small that it gets only the conservatives? We live in a strange country. And at a very strange time. Even the effing dogs are caught up in the spectacle. Just get a couple of Great Danes. Photo courtesy of Nara U. From a 1933 kennel advertisement. 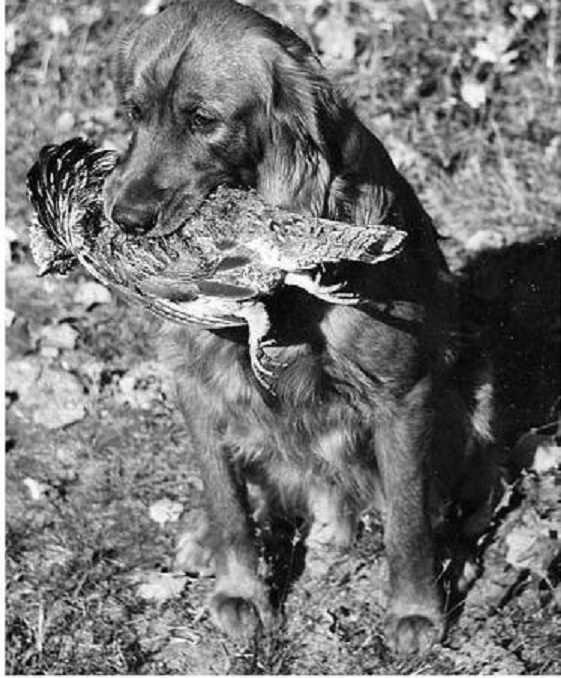 This is Featherquest Rocky retrieving a grouse in either Massachusetts or Maine. He was bred by Rachel Page Elliot, who was one of the first people to introduce golden retrievers to New England. She was also one of the driving forces in the golden retriever breed in North America, and all the dog show people know about her work on canine gait and structure, which is called Dog Steps (1973). 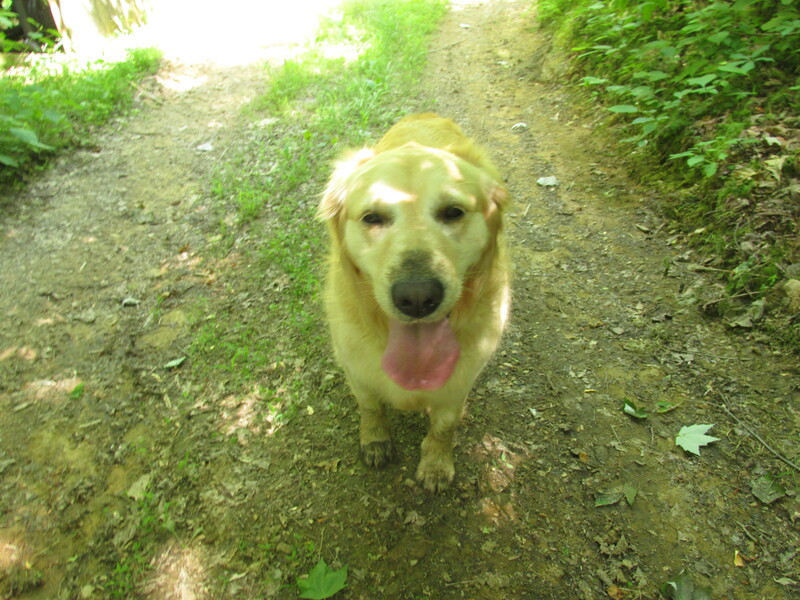 This image comes from From Hoofbeats to Dogsteps: A Life of Listening to and Learning from Animals, her memoir of her life raising golden retrievers and Connemara ponies, as well as her research into canine gait. This dog is only nine months old. Most likely, the dog flushed the grouse, for this particular species is unlike the various grouse species of the British Isles. It is usually solitary and is only found in the densest of thickets. The notion that one could drive them the like the British do red grouse is simple folly. To hunt one of these birds, most people use pointers or setters of some sort, but those who use a flushing dog use one that ranges in really close. That’s because these birds will hunker down and won’t move until the very last second, and they are so well camouflaged that you can’t see them until you’re very close. Some dogs are very keen about flushing them. My first golden retriever would always flush one if she could find it. Miley has flushed only one and that was on accident. I should note that one can tell this is a ruffed grouse by the banding on the tail feathers. In most of the Eastern US, the ruffed grouse is the only species of grouse one can find. In my part of the country, it is the only native game bird that still exists in decent numbers. Wild turkeys, which are much more common, are actually considered “big game” by my state’s DNR, and they are regulated in much the same way that white-tailed deer and black bears are– very strict bag limits and a requirement that they be checked in at an official game checking station (which is usually a convenience store or gas station!). The bobwhite quail that thrived during West Virginia’s agrarian age now exists only in very small relict populations. I’ve never seen a wild-born bobwhite quail here, and the only wild ones I’ve ever seen were coming out of a cornfield in eastern North Carolina. My grandpa told me that the last ones he ever shot were in a sweet corn patch behind his parents’ house in the late 1970’s. The late 70’s and early 80’s were years of harsh winters for most of the Eastern US, and when the fur market collapsed at about that same, raccoon and fox numbers shot up. And there simply weren’t enough cornfields and old brushy pastures to hold the bobwhites. A few years ago, my uncle tried to stock bobwhites on my grandpa’s property. He bought 96 of them from a breeder in Georgia. He turned them out, and we soon were surrounded by singing little birds that weren’t much larger than pigeons but tamer than virtually any domestic chicken. The local foxes, feral cats, and hawks were very appreciative of this fine repast! Ruffed grouse, though, are hardy survivors. Natural selections has forced them to become very good at hiding in this mesopredator-infested world. The decline of the bobwhite and its empire of fields has been met by the rise of the brushy redoubts of the thunder chicken. They live like little avian outlaws, largely undetected until someone goes out in pursuit of them with a dog and shotgun. Did Disney ruin the Dalmatian? Dalmatians are a breed that drives me crazy in many ways. One of them is I don’t believe for a second that they are from Croatia, Ancient Greece or Egypt, or Neptune. All of the images of supposed Dalmatians from Croatia that date from several centuries ago are very unconvincing. The paintings I’ve seen show dogs that would clearly be called proto-Great Danes, Istrian hounds, or perhaps something akin to a Croatian podengo. My own take is that these dogs are nothing more than aberrant pointer or pointer-setter crosses that became fashionable running along coaches of country gentlemen in England during the middle part of the eighteenth century. I don’t have much evidence for this theory, other than the genetic studies on Dalmatians have nested them within the pointing gun dog breeds. We have no smoking guns in the form of pedigrees or kennel records. Now, if the dubious breed origins story about this breed weren’t enough, there is another myth that has long existed about Dalmatians. 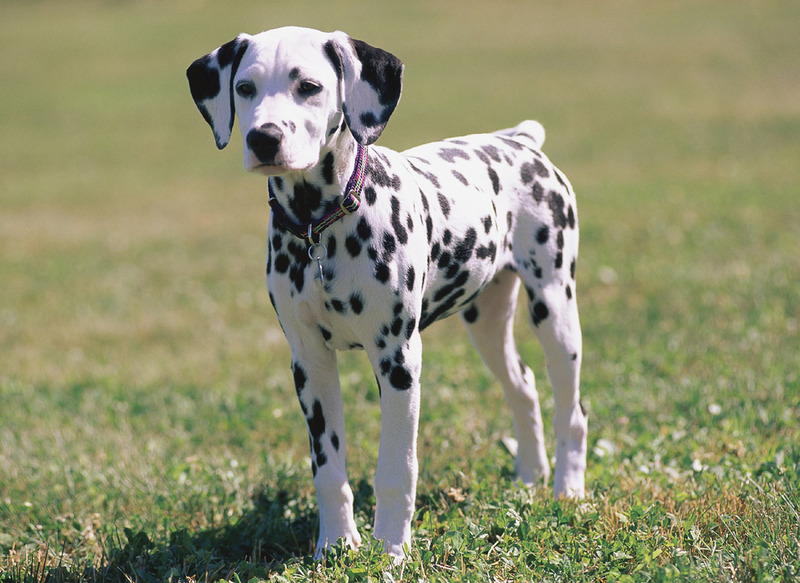 Dalmatians, of course, are famous in several Disney movies, including the original animated 101 Dalmatians film, its live action version from 1996, and the live action version’s sequel. These films were said to have caused a massive boom in Dalmatian popularity. AKC registrations skyrocketed. Puppy millers made great fortunes selling the puppies to families who wanted them. And then when the families discovered that Dalmatians are very high energy dogs and some of them are somewhat aggressive and are inappropriate as family dogs, the shelters filled with lots of poorly bred and poorly socialized dogs. But did Disney really deserve the blame? Well, Chris, over the BorderWars blog, has decided to test this hypothesis empirically. Using the time in which Disney released its films and AKC registration statistics, Chris tried to figure out if any correlation existed between the release of these movies and a rise or fall in Dalmatian statistics. Despite the prevalence of claims that Hollywood drives fads in dog breed popularity, there’s little evidence that this is true. In fact, actual data sharply contradicts the unthinking mantra that popular movies make for popular breeds. The converse is the more likely scenario: already popular dogs get featured in moves. Hollywood mostly follows trends, rarely does it set them. The often repeated conventional wisdom is that Dalmatian puppy popularity spiked following releases of Disney’s 101 Dalmatians: from the original in 1961 through the re-releases in 1969, 1979, 1985, and 1991; and the live action film in 1996 and its sequel in 2000 with a TV show between them. The registration data just doesn’t support the idea that every time Disney comes out with a Dalmatian movie the breed experiences a popularity boom as we see just as many declines in popularity or stable runs of popularity as we see increases. If Disney is a factor at all, it’s clearly contingent on a other factors coming together that simply aren’t present during most of their releases. So Disney gets blamed for a whole series of welfare issues that it didn’t likely cause at all. To be honest with you, having known a few Dalmatians over the years, I know they aren’t what I like in a dog. Even if they do look like snow leopard pointers. Which I think is a better name for them.